What has 414 legs and four ways to procreate? Until recently, nothing. Or so it was thought. 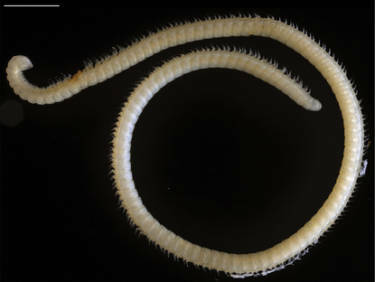 Scientists have discovered a species of millipede with those far-out features in a cave in California's Sequoia National Park. The pale bug's 414 legs are fairly meager for a millipede. Some species have as many as 750. None have 1,000, despite its name meaning "thousand feet." Like some other species, this millipede has four modified legs that are used as penises. A statement Monday detailed the discovery by Jean Krejca of Texas-based Zara Environmental LLC. Millipede experts Paul Marek at Virginia Tech and Bill Shear at Virginia's Hampden-Sydney College classified the critter. It's named illacme tobini (ill-ACK'-mee-toh-BEE'-nee), a play on the name Ben Tobin, a former cave biologist with the National Park Service.